i'm never gonna work for someone else ever again. i've been working as a graphic artist and specializing in clothing production my entire life. not to have my ego obscure reality ... but in comparison to other companies work that i've seen compared to mine ... i'm the best. i think that employers see this and instead of looking at it as an opportunity for their company, they look at it like an opportunity to get as much out of me as they can, before it reaches a situation where they might have to actually pay me well for the work that i do. i think my past employer has been picking fights with me over nonsence the last few months, to get me to react so that he would be justified in firing me. i've just continued to not complain and do my job. we've had 15" of snow over the last 2 days. i missed yesterday (after driving for 2 hours and not being able to get one town over), and after digging myself out for 2 hours and getting to work at 10:30, my boss asks for my key and tells me to go home. so much for working hard and being committed to my employer. no commitment to me as an employee whatsoever. i've just surrendered, said, "good day sir!" and walked. good riddance. $.40 raise last year and no health insurance or vacation / sick days ... you gotta be kidding me. now its to the point where this is a pattern with past employers. i gotta do something else. i gotta see if there are programs available these days, for someone like me, to help me (amy and i) get a business started. You're welcome Bro. I'm sorry to hear about this, and after having just gotten back to work myself after a year of being unemployed, I can totally relate. It's a sad fact that most employers are driven by money, meaning, how much they can get while having to spend as little of it as possible. It sounds like your last company was headed by the typical jerk-faces that typify this concept, and that you are much better off without them. And I also say that it's their loss for letting you go. I've tried to start my own business in the past, but I usually lacked both the funds and the patience necessary to do it properly. But I am certain there must be programs out there for someone like you and Amy. I did find a lot of investment opportunities for people wanting to go into business for themselves. Usually it involves pitching your sales model to a potential investor with the contractual agreement that they will earn a percentage of your profits in return for funding your business. You Guys going to be OK in the mean time? Unemployment compensation (after an appeal, im sure), take a PT stocking shelves or painting and putting off renovating the kitchen and use that savings to eat and pay bills ... yeah, I think we'll live. Hang in there, Bro. It will all work out. wow sorry to hear that. Maybe I should give you a project bass for a quick couple hundred? Yeah ... I can turn that around and shipped back to you within 2 weeks. a few more bucks but ... that colorshift paint is cool. Ill call you monday night. 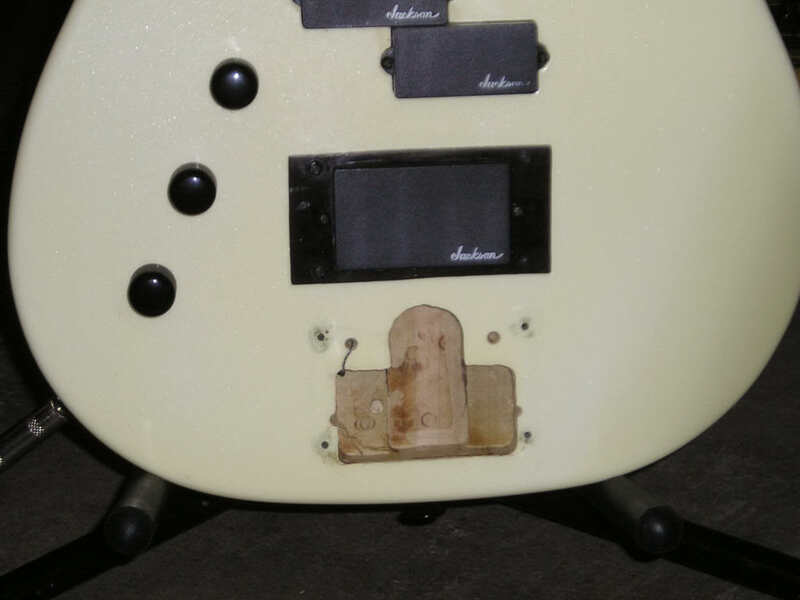 i'd rather not drop 1/2 a grand into a plywood bass and ya the black on it is pretty rough to say the least, but we will talk about it and see what we can come up with. I finally found the master catalog of all bently stuff I lost and now I know it's a 2295.
since your a graphic artist and you have the original logo to trace, you could paint the whole thing an off white and put a black waterslide on it so it looks old like the charvel. Now that I bought that lefty KramerForum, Striker and that SR300, some other units are goona go. 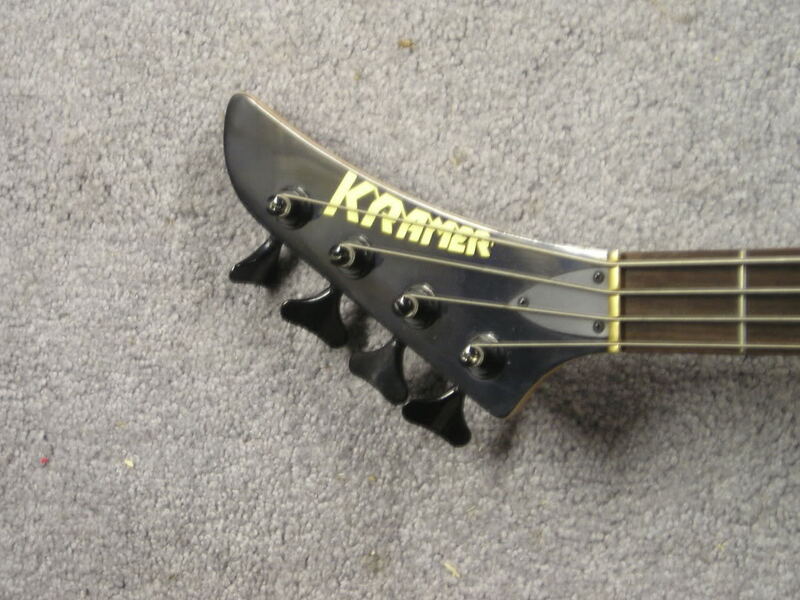 I'm gonna sell my red Kramer Frankenbass and the ZX70 since they are rightys that I'll never use so I can see how much I can spend with this thing since I'm gonna keep it. Going into any resto job, its key to make sure not to invest more into it than the bass is worth. My guesstimate for that series 10 would be about$ 150. Routing : $40. 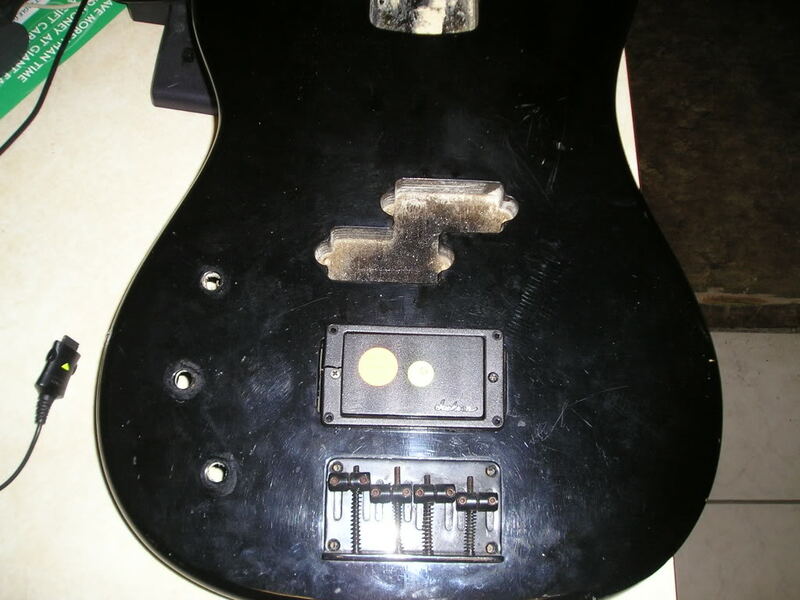 Headstock repair : $30. Custom pickup ring (unless there's a stock part you know would work) : $30. Wiring : $20 (cuz. Its easy). Ide feel bad if I didn't harvest some knobs out of the parts box : $10. Sand and paint. Because its ply, I wouldn't strip down to the wood. Only sand for a paintable surface and smooth any battle scars or dings. Same with custom paint design (like the ritter steelers bass for example) $90 - $130, depending on time spent. 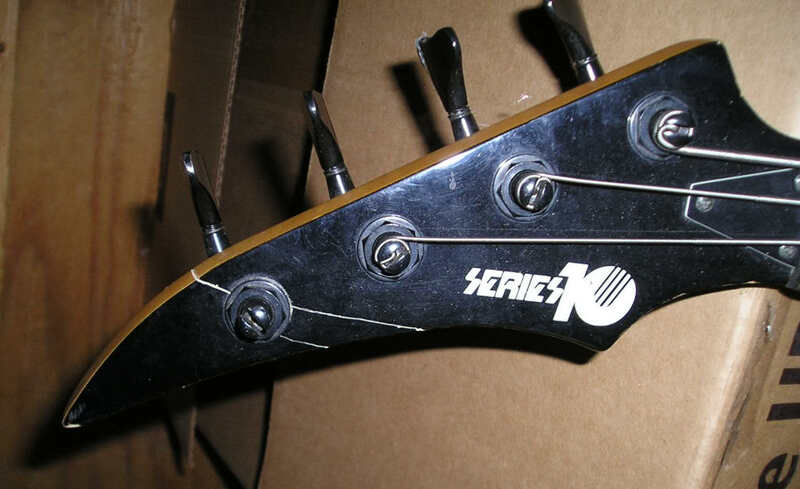 And maybe just ego ... custom design, I wouldn't want to put the manufacturers logo back on the headstock. Overall, whatever your looking to spend, you will definately get a much nicer bass back. 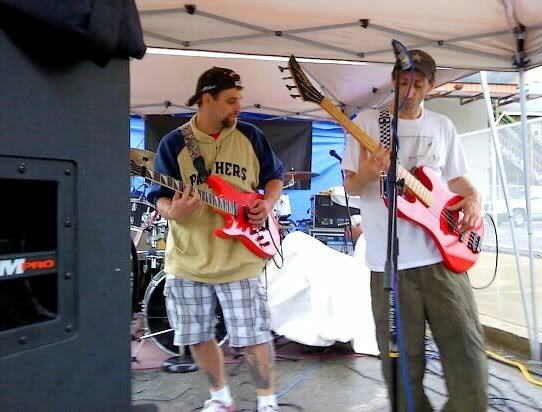 The krammer with the black headstock ... are those tuning keys facing the audience? yes. the OEM Charvel neck has dented frets from some retard dropping it I think. Last time I used it was at our May2010 Marathon gig when I knew it was gonna be raining and didn't want to get my white one wet. this series10 will get a preamp in it but instead of drilling another hole, I'll stack the B/T pot. Knobs and all that junk I'll send with it. kewl ... its a go. I found this free web site for Freelance graphic artists source site you might be interested in. BD, Mike is going to restore my series10 but if the steelers win the SB, I'm changing my mind on what color it will end up. ( I spoke to mike for a hour or so last night, and we are gonna paint it white, but not if the steelers win. thanx BD. ill post some stuff there ... but i definitely wont come up in the "cute" category ... nor do i think i could design kids toys. i dont have any kids. i dont want any kids and a lot of time ... i dont want others to have kids either. i dont know how that could have come out any other way but negative. let just say this .... kids dont seem to like me very much. eh. I CUT MY HAIR! geeze, i feel like a tool and a sellout. i feel like i should be selling insurance or something now. whatever ... its just hair. it grows back. my hair was donated to lox of love and will go to a cancer patient. kewl. the red one I'm flipping in the picture? or do you mean this one? ok Mike I got all the junk together to send you the unit. It will probably be in 2 separate boxes cause I cant find a box wide enough to put the neck in, and I don't want to send a huge box if I don't have to. It will go out to you as soon as you PM me your address with the invoice cause we forgot to give that to me when we were on the phone. or email it to gbats@knac.com. ya know ... i'm looking at that jackson / kramer headstock again. it just that its at a funny angle. it looked to me like the keys were sticking out the front of the headstock and the strings were wrapped around the base. not a major point ... they are only tuning machines ... but aside from lollipop and the standard micro, the only other machine head option is like the old ampeg stand up bass with the donut hole tuning machines. you'de think someone would have come out with something new and different ... if it was only just weird. i got the invoice out to you in an email this morning. I replied on both of them. As soon as I can find a box here at work long enough to put the neck in, I'll send it up to you. Probably tomorrow/Thurs since I'm jammed up here today with work and can't leave to go to the UPS or USPS.